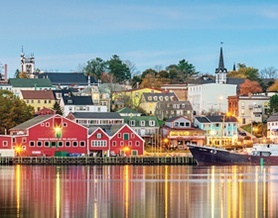 Atlantic Canada Explorer – The Great Canadian Travel Co.
2020 sailings, save 15% for bookings made by October 31, 2019. (See Tour Notes for details). Springtime on Canada’s east coast is a time of bloom and bounty. Trees and flowers burst into bloom, marine mammals are on the move, and seabirds flock in the thousands. Explore highlights of Newfoundland, Nova Scotia, New Brunswick, and Saint-Pierre—expedition style! Sale discount will be applied to the berth cost only for 2020 sailings. Regular prices are listed below before any discount has been applied. Prices are shown in US$, per person, based on four people sharing a quad cabin, three people in a triple cabin, two people sharing a twin cabin and one person in a single cabin. Just off the shores of Newfoundland lie the islands of Saint-Pierre and Miquelon—an official territory of the French Republic. The colourful town of Saint-Pierre makes a charming beginning to our trip. Winding streets lined with shops, houses, and cafes bring a taste of Europe to the east coast of North America. You will arrive in Saint-Pierre from our charter flight, where you will be transferred to the Ocean Endeavour. Today we call in at Cape Breton Island—a fiercely independent region of the province of Nova Scotia. Our destination is the fishing village of Chéticamp. The busy harbour rug-hooking museum, local shops and restaurants offer a taste of Acadian heritage in a thoroughly bilingual town. Nearby Cape Breton Highlands National Park is world-renowned for scenery and wildlife. We’ll be hoping for favourable conditions to hike the magnificent Skyline Trail. In the struggle between English, and French colonial powers for control of what is now Canada, the French Fortress of Louisbourg on Cape Breton Island played a pivotal role. Established in 1720, the fortifications were captured by the British in 1745, returned to the French, captured again in 1758 and then destroyed. Reconstructed in the 1960s and 1970s, the Fortress of Louisbourg is a National Historic Site, offering a fascinating glimpse into military colonial Canada. Nova Scotia’s southwestern coast provides habitat for seabirds and marine mammals in abundance. We’ll be seeking opportune sea and weather conditions to observe the wildlife in this region. 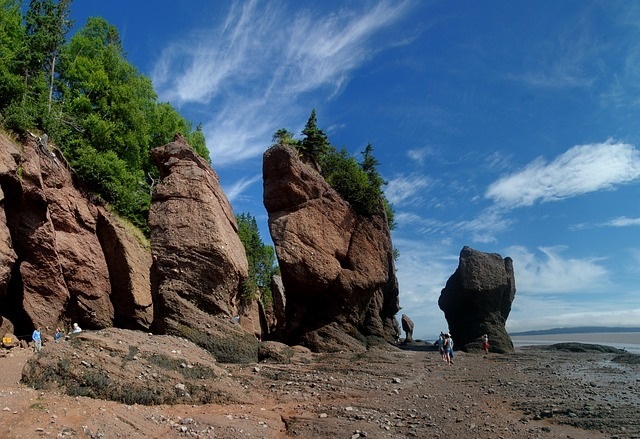 The rugged coastline of the Bay of Fundy is world-famous for its world-record high tides; here the waters of three rivers join the Fundy tides. Along the southeastern shore of the bay lie peninsulas, mountains, and picturesque inlets. It is also home to some of the highest tides in the world, and is famed for marine mammals and seabirds. The area borders Nova Scotia’s French shore, where Acadian influence is strong. the founding of Port-Royal in 1605 by the French and their Mi’kmaq allies, and the conquest of Acadia by England in 1713, the region was hotly contested. The Fundy Isles—Campobello, Grand Manan, and Deer Island—are an archipelago at the mouth of the Bay of Fundy. Their only land connection is via bridge to Lubec, Maine. Island residents can reach Canada without crossing the border only in summer— by two ferries. The islands feature historic sites, including a park jointly run by Canada and the US. Birdwatching, marine mammals, and scenery—as well as the famous Fundy tides—round out the attractions. The port of Lunenburg once harboured a fleet of sailing vessels, including the famous Bluenose. Old Town Lunenburg was declared a UNESCO World Heritage Site in 1995. British colonial town plans ignored topography, making for several very steep streets. St. John’s Anglican Church, the Lunenburg Academy, the Fisheries Museum of the Atlantic, and dozens of shops, cafes, and galleries line the hilly streets of the splendid harbour town. We’ll spend the afternoon exploring its treasures! A sandbar as long as Manhattan—but only about a kilometre wide—Sable Island is home to many varieties of birds, including the endemic Ispwich sparrow, hundreds of grey seals, and the world-famous Sable Island horses. Unique weather conditions prevail at Sable Island. Our scheduled two days here allow us to maximize opportunities to explore the dunes, cruise the shores and view the wildlife. We’ll also learn firsthand about Sable Island’s fascinating human history. En route to Newfoundland, join our wildlife spotters on deck, watching for seabirds and marine mammals. We will be crossing The Gully, a Marine Protected Area where the sea floor suddenly drops a dizzying two and a half kilometres into a submarine valley. The Gully is one of the most prominent undersea features in eastern Canada and its unique ecology has attracted the interest of many agencies, such as Parks Canada and Environment Canada. This is due to its significant coral communities, its diversity of both shallow and deep-water fish, and its many whales and dolphins. Our resource staff, scientists, historians, musicians, and artists will continue to engage us with workshops, presentations and entertainment. We’ll be immersed in the spirit of the East Coast all the way to St. John’s! Welcome to St. John’s—Newfoundland’s historic, vibrant capital. St. John’s has been continually fished since 1498, making it North America’s oldest European settlement. Architecture, shopping, night life and cultural attractions make St. John’s a sightseer’s delight. Make sure to be on deck as we sail through the Narrows to conclude our voyage by sea! We will say goodbye in the port of St. John’s, disembark the Ocean Endeavour, and head onward to our next journeys. 2020 sailings, save 15% on the berth only cost on any sailing on the Ocean Endeavour, for bookings made by October 31, 2019. The discount is subject to final approval by the cruise line at the time of booking and may be changed or withdrawn without advance notice.